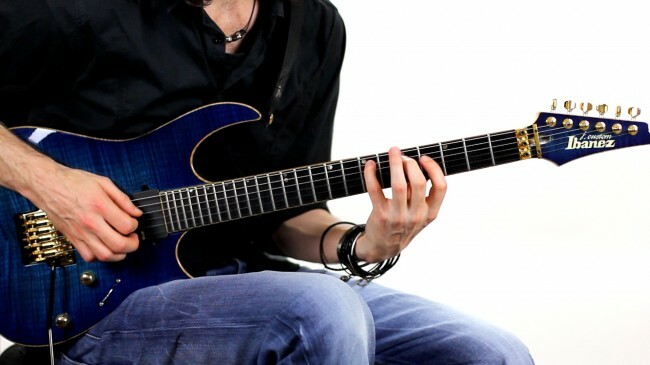 Set your fretting hand with the thumb in the middle of the neck, and dropped low with plenty of space underneath, the index finger set fairly flat so as to mute any un-played strings. Stretch and reach for the notes, keeping the hand still and shaking off any tension as it arises. Memorise by playing through slowly until comfortable before applying speed. For the audio I used an Axe FX II set up with a Marshall Brit 800 Mod type sound (boost set off) with TS808 tubescreamer overdrive with the drive set to half and some medium room reverb (stereo delay from logic on mixdown) and pseudo double tracking (doubling the track and delaying one side/panned hard left and right), straight to an Apogee ensemble card into a Mac Pro running Logic. For Video, a Canon 60D and FCP X for editing. Guitar wise, i used my Ibanez J Custom JCRG-2 TB with EMG pick-ups. (see gear page). The supporting video goes into some detail breaking down the examples in a way that will be accessible for intermediate level players. To check out the video please click here. This entry was posted on Monday, August 26th, 2013 at 11:22 pm	and is filed under News. Responses are currently closed, but you can trackback from your own site.